Graphic art design is everywhere you look. Whether you are browsing the web from your mobile device or using a PC, you will find that websites are filled with vibrant colors and stunning imagery. As a web graphics artist, it is your responsibility to create graphics to meet customer needs. Graphic design is filled with numerous possibilities from working with product packaging to working for website owners. Becoming a designer will require a bachelor’s degree for most entry-level positions, or previous experience with a stunning portfolio. According to the Bureau of Labor Statistics, the average median pay in 2012 was $44,000 per year. Between the years 2012 and 2022, the field is expected to increase by 7 percent. The pay is drastically different from working in the suburbs to the inner-city where cities, such as Manhattan, demand a much higher pay scale. Entering this field opens up a slew of potential job opportunities, such as working for another company or becoming a freelancer or contractor. 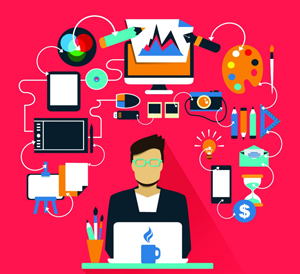 Graphic artists are the backbone of the Internet and the demand for experienced employees is on the rise.